Someone was asking me in the comments the other day about my food routines. They were curious about how often I shop, my favorite stores here in SF, when I cook - that sort of thing. I'm also curious about your food routines, so I thought I'd share mine in the hope that you would share a bit about yours as well. I should also work a recipe in here, so I decided to highlight a decadent, crunchy-topped summer squash gratin I made last week. It was inspired by a mountain of summer squash I encountered at the farmers' market - yellow squash, green squash, patty pans, globes, and others I couldn't even identify. The gratin recipe features lots it, thinly sliced, with new potatoes, an oregano pesto, and brown-buttered breadcrumbs all baked at high-temperature until the squash is tender and the top is crunchy. I used a mix of yellow and green squash, but you can certainly experiment with whatever you have on hand, or whatever your garden might be producing. So, the cornerstone of my food routine is a weekly trip to one of the nearby farmers' markets. I stock up on whatever looks good, and typically that means lots of vegetables, a dozen+ farm-fresh eggs, some tofu, seasonal fruit, almond butter, bread, etc. If I end up running low on anything between markets I walk over to Bi-Rite Market and pick it up there. They source ingredients from many of the local farms around here, and even grow some of their own crops now. Once or twice a month I like to go to Rainbow Grocery or Whole Foods and stock up on pantry staples. I hit the bin section for interesting whole grains, flours, beans, lentils, and that sort of thing. Beyond that, if I'm at the Ferry Building I love to stop in to see what is available at Boulette's Larder - beautiful, rare, artisanal sugars, spice blends, grains, oils, and vinegars. I always come across something special and inspiring there. As far as beverages go - I love to visit Keri at Biondivino. She carries lots of the small Italian wine producers I like. Or I'll pick up a few bottles after chatting with Josh over at Bi-Rite - I walk there, so that keeps my purchasing in check. Wine can get heavy ;) Wayne is in charge of most beer runs, and lucky for us, one of the best destinations for artisan beers is a short five minute walk - Healthy Spirits. Wayne is also the barista and tea brewer around here - we buy a lot of Blue Bottle beans, and order tea from Sebastian at In Pursuit of Tea. So, generally speaking, I'm mindful of what I buy, I shop close to home, and (stating the obvious) I cook quite a bit. A few people have asked how much I spend on food. I think I cook on the cheap - kinda. I'd never try to represent myself as a bargain shopper, but because I don't spend money on meat, fish, or poultry, it is easier for me to spend money on great olive oil, eggs, or perfect cherries - and still come out ahead financially. I happily pay $6 - $8/ per dozen eggs, and good cheese is another higher-ticket item for me, but I typically use it as some sort of accent. Most of the organic grains and flours I buy cost between $1 - $2 per pound. Stunning, heirloom beans come in at about $5 per pound. And as anyone who has done it knows - cook a pound of dried beans and you have a whole lot of food on your hands. The organic summer squash I used in this recipe today cost $2 per pound. Onto the gratin - all you squash growers have got to give this one a go this summer - it is as decadent as I get, plenty of olive oil and butter here, but sooo worth it. Be sure to slice your potatoes as thin as possible. They get all melty and creamy. Slice them too thick and you'll have trouble cooking them through because the zucchini cooks up more quickly. I use a box grater to shred the cheese here (as opposed to a micro-plane) - you get heartier, less whispy pieces of cheese which is what you want here. I'd also strongly recommend homemade bread crumbs here (see asterisk below). Preheat oven to 400F degrees and place a rack in the middle. Rub a 9x9 gratin pan (or equivalent baking dish) with a bit of olive oil, sprinkle with lemon zest, and set aside. Transfer the squash to the lemon-zested pan, top with the remaining crumbs, and bake for somewhere between 40 and 50 minutes - it will really depend on how thinly you sliced the squash and potatoes - and how much moisture was still in them. 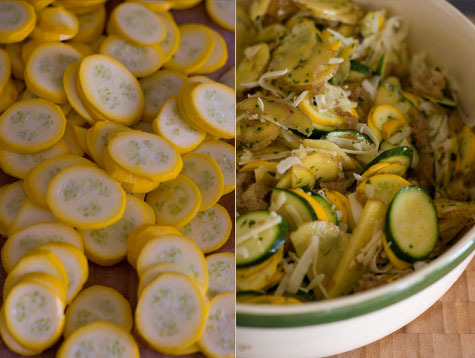 You don't want the zucchini to go to mush, but you need to be sure the potatoes are fully baked. If the breadcrumbs start to get a little dark, take a fork and rake them just a bit, that will uncover some of the blonder bits. Remove from oven, and drizzle with the remaining oregano sauce. *To make breadcrumbs cut the crust off 2-3 day old artisan bread. Tear into pieces the size of your thumb, and give a quick whirl in the food processor. I don't like my breadcrumbs too fine - and tend to leave the pieces on the large size - more like little pebbles than grains of sand. A favorite zucchini bread recipe - green-lined strands of shredded zucchini, lemon zest, poppy seeds, and fragrant notes of coriander, cumin, and clove make this a very special zucchini bread recipe.